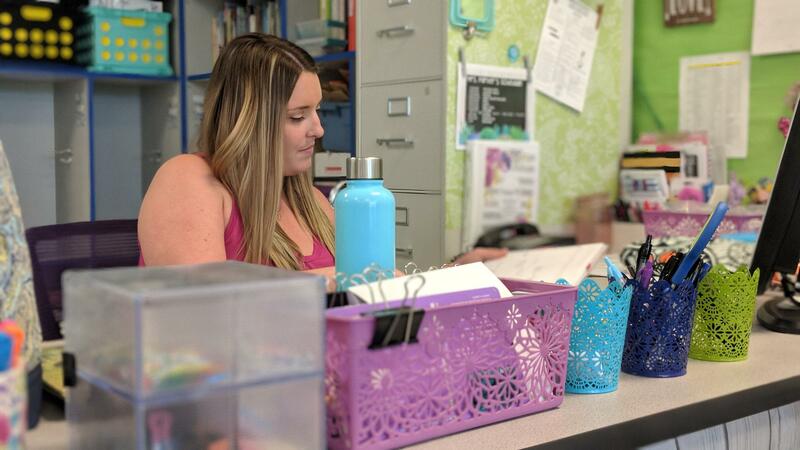 New Hanover County teacher Jenna Parker looks through her planner at her desk in her second grade classroom at Anderson Elementary School in Wilmington. Since the day Hurricane Florence began battering the North Carolina coast, WUNC’s education reporters have been following staff and families in New Hanover County Schools, as they first weathered the storm, and now work to put their classrooms and schools back together. 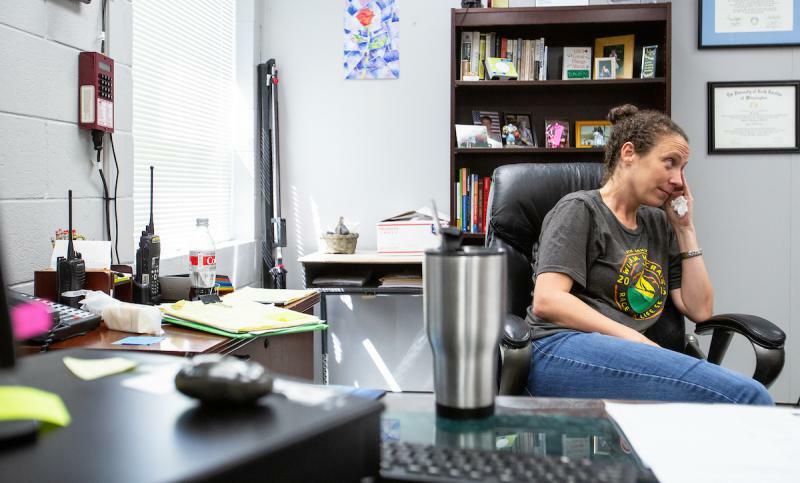 Lisa Philips reports on a New Hanover County teacher preparing for her students’ return, while navigating the upheaval that Florence wreaked on her own family. Teacher Jenna Parker is putting the little chairs back at the little tables in her second grade classroom at Anderson Elementary School in Wilmington. Each student’s spot is labeled with a nametag. Parker starts peeling one off. “This name tag’s going away,” she says. “This child is not going to be coming back to sit in this seat when they get back." Parker gestures to the rest of the table, where four name tags remain. Those students are going to wonder where that child went, she says, and why he isn't there. This is the first day Parker has been in her classroom in three weeks. On the Monday night before Florence hit, she and her husband moved their daughter’s toys from the backyard to the garage, and got ready to leave. Parker had spent the day having difficult conversations with her students. 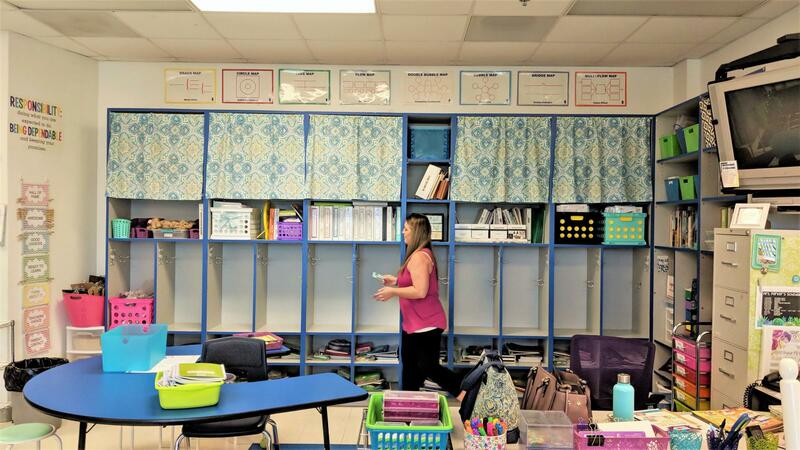 Teacher Jenna Parker tidies up the cubbies in her second grade classroom at Anderson Elementary School in Wilmington on Oct. 2, 2018. Her students are returning to school in two days -- after missing more than three weeks of class because of Hurricane Florence. At 4 a.m. the next day, Parker and her husband loaded their three dogs and 2-year-old daughter into the car and hit the road. They headed to a relative’s house in Florida. “The biggest thing for me was just kind of shielding my daughter from it,” Parker says. The day after the storm hit Wilmington, Parker’s mother-in-law was able to check on their house. She had stayed in town. Parker and her husband came back to a water-logged house strewn with insulation, sheetrock, and moldy furniture. The only room that stayed dry was their daughter’s. So that night that Parker thought might be her daughter’s last in her own crib, wasn’t. When Parker and her husband moved into their temporary rental, they were able to recreate their daughter’s bedroom. She hopes the same goes for her students, who have been out class for more than three weeks, when they come back to school in a couple of days. Fortunately, her classroom didn’t have any damage. 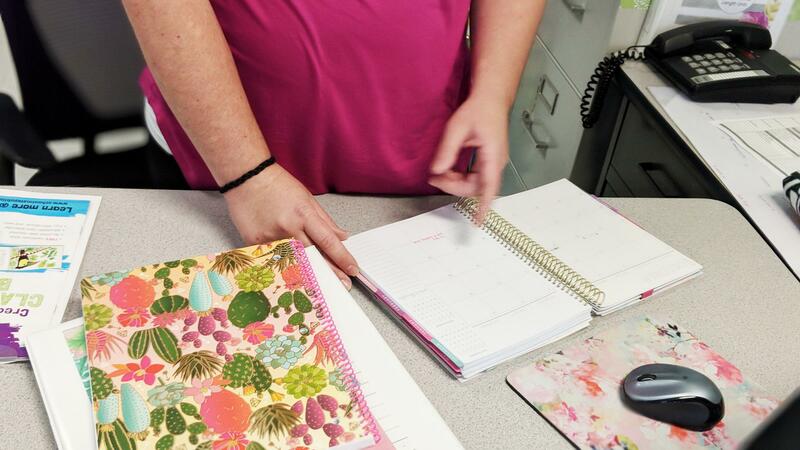 Teacher Jenna Parker points at the month of September in her planner; she and her students missed school for most of that month because of Hurricane Florence. When storms roll into Wilmington, Trask Middle School usually serves as an emergency shelter. But the school’s principal Maggie Rollison knew Florence was different when shelter guests started arriving 10 hours before the shelter opened. 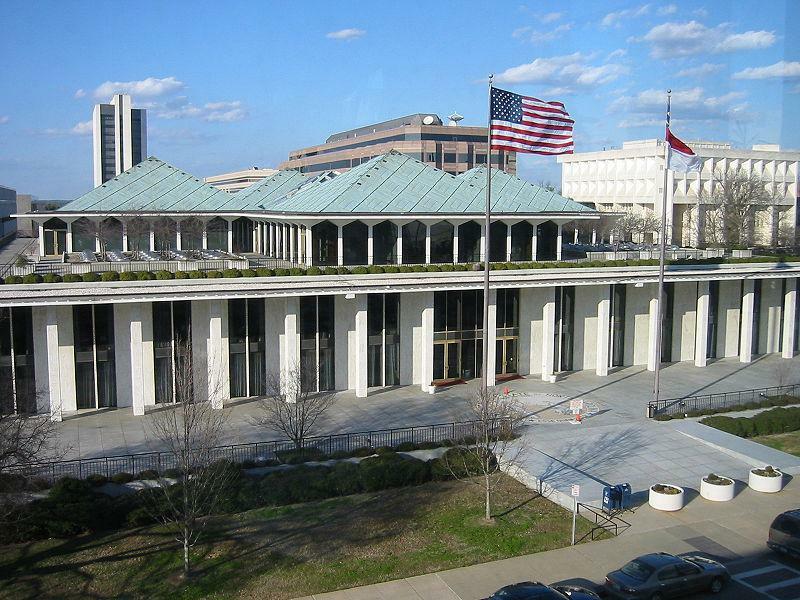 State lawmakers have passed a bill to address all the days some schools have missed in the wake of Hurricane Florence.